Low carb popper chicken is where it’s at for this week of eating healthy for Friday. Low carb popper chicken is a great way to get your body back on track for the weekend. Especially if you like chicken. I came across this recipe and wanted to share it. How to make low carb popper chicken is simple and easy all you have to do is eat out.. Just joking just follow the ingredients i listed below to get started its really easy to make. Ingredients for low carb popper chicken is simple to follow, i hope you and everyone else enjoys it. “Immature jalapeno capsicum annuum var annuum”. 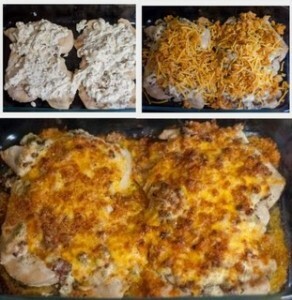 Place chicken breast in a 13×9 casserole dish and bake until juices run clear. 30-40 minutes, depending on the size of the breast. While chicken is baking, fry bacon pieces until crispy. Remove bacon and add onions and saute until tender. Remove from heat and add crispy bacon, onions, jalapenos, cream cheese, mayonnaise, cheddar and Parmesan cheese. Mix until well combined. Remove chicken from oven and reduce to 350 degrees. Spread jalapeno popper mixture all over each Chicken breast until well covered. For the topping, mix together Parmesan cheese and melted butter. Sprinkle on top of jalapeno popper topped chicken. Bake until the tops are lightly browned, about 15 minutes. submitted by AuntBeesRecipes.com – much more here!